On Wednesday evening (15/06/11) after a mildly stressful day at the office Mr FF and I headed up Gloucester road for an 'evening with designers/artists at Charlie Boots'. Charlie is a Bristol based ethical fashion designer and now has a lovely unique shop on Gloucester road. She has a lovely mix of her own fashion and pieces from other artists. It had photography by Michael Reeves and Deborah Weinrab on the walls and the window display was by illustrator Kirk Stacey. Charlie informed me that she is interested in local artists using her window to display their work and create interesting and varied window displays. She is also keen to allow other ethical designers exhibit their work on her rails for limited periods to help raise awareness for other ethical fashion brands. The shop was great and there was not only clothing and bags but jewellery, furniture, clocks made from vinyl and beautiful pottery. If you get the chance to pop up Gloucester road (a must do anyway as there are some wonderful vintagey shops) please do stop by Charlie Boots. She is also running workshops where you can learn to sew dresses, skirts, bags, cushions, underwear, purses or textile art with experienced and skilled tutors. To find out more about this service go to the 'news' section of her website. Bristol hairdressers will attempt to set the World Record for the highest number of topknot hairstyles completed in one day today (11/06/2011) at Cabot Circus. The event is organised by Bristol based fashion website MyStreetChic.com. Bristol shopper's hair will be transformed into the iconic topknot style as part of a speed styling challenge. A team from Robin James Salon Ltd will attempt to get through as many topknots as possible to score a World Record - and put Bristol firmly on the style map! I wish them the best of luck!!! The topknot, otherwise known as a super high bun, has been hailed as the hairstyle of Summer 2011, with celebs like Kylie, Gwen Stefani, Blake Lively and Whitney Port all rocking the look. Shoppers in Cabot Circus today will be able to get their hair styled into a topknot for free and become part of the attempt. 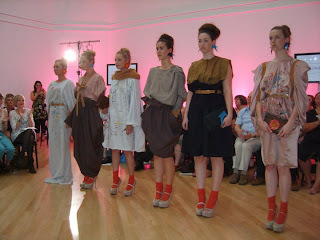 Everyone who gets a topknot will also receive a free MyStreeChic.com goodie bag, packed with stylish treats!! Want a new look to go with your new 'do'? Make-up artists from Bobbi Brown at House of Fraser will also be on hand offering free makeovers, while the Sactuary Spa will be providing mini-manicure. The event is being held to celebrate the launch of MyStreetChic.com, a new Bristol based fashion website that will cover all things stylish in the city. "Bristol is home to a hotbed of different styles. MyStreetChic.com aims to celebrate what's best in the West for fashion and, with this World Record attempt we hope that people will sit up and take notice of Bristol as a style capital," said Gina Dyer, Editor of MyStreetChic.com. If you want to take part in the Great Topknot Challenge, head down to the MyStreetChic.com std in the main street at Cabot Circus TODAY 11th June between 10am and 6pm!! 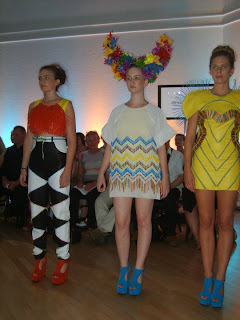 Last Saturday was UWE fashion and fashion textiles graduate's show. I can still remember the stress and excitement from mine so I was very much looking forward to this years ideas and designs. After a lovely day at the Cottage Inn by the River I headed to Bristol's RWA, which is an art gallery. A really light airy space and very intimate - I knew I would be able to get a close look at the garments as they came down the catwalk. The first collection that graced the stage was Sarah Cassidy's. A brightly coloured knitted collection inspired by an anatomical heart locket. 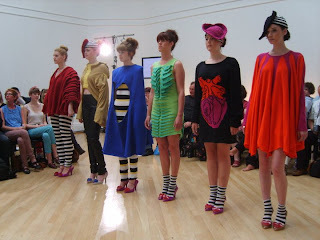 Acid green, bright blues, black and white stripes all teamed with Vivienne Westwood shoes made for a very exciting start to the show. 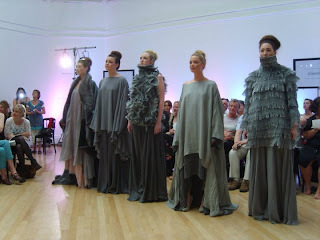 Edward Lord's dramatic grey sculpted collection was very impressive with a luxurious fur trimmed coat and long draped dresses. 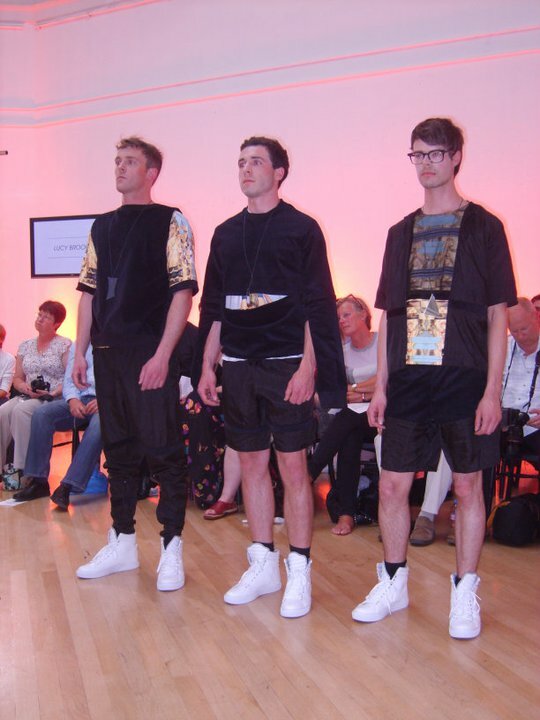 Lucy Brookes' printed menswear created from abstract pin up girls. 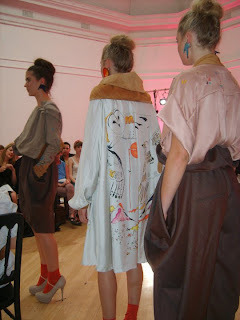 Jenna Lauren Dawson's collection featured wonderful, drawn bird embroidery and print patterns. 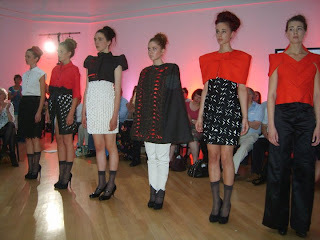 Elaine Youh's collection featured complicated fabric manipulation in a colour pallet of red, black and white. 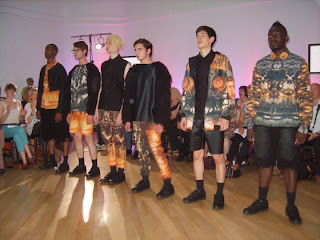 Tolga Ozturk's menswear collection inspired by gorillas was very striking in blacks and orange. One model even had some eyes draped over his shoulders. 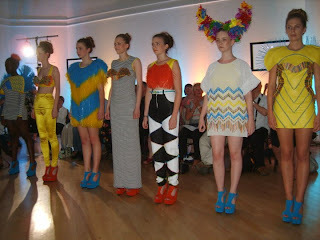 Nicola Chisall's impressive plastic carnival inspired collection closed the show in a blur of bright colours and complicated construction. I really enjoyed the show well done to all the graduates and good luck for what they might do next! I will do a separate blog post for the 2D work. Please check out my review of the show for Guide2Bristol. P.S thank you Steve Norton for the photographs!